We thoroughly enjoyed our stay at the Holiday Inn Resort Benoa in 2015. 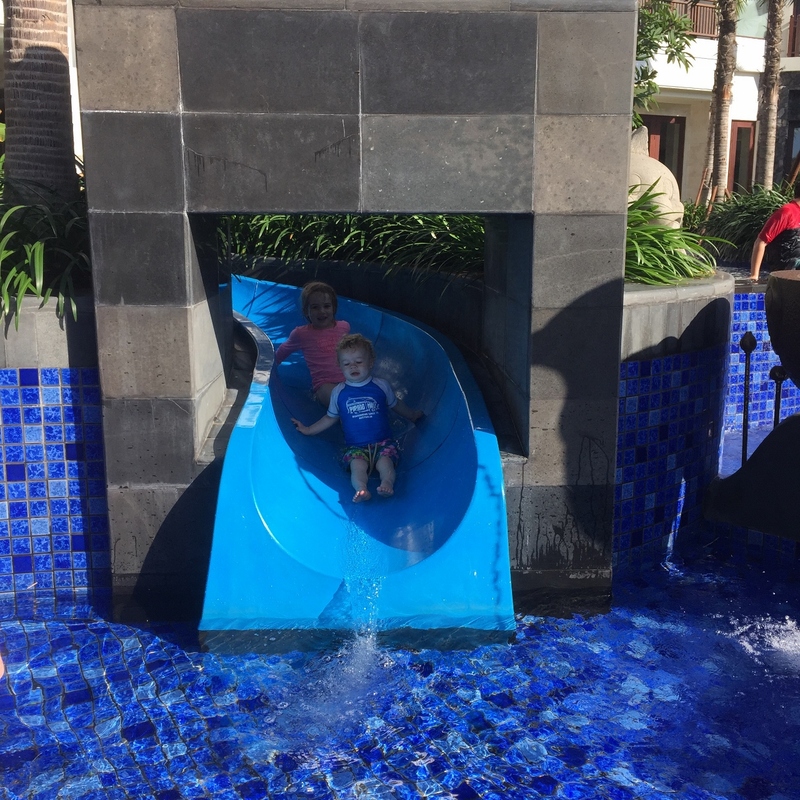 The kids were welcomed from our arrival with it taking no time at all for them to run to the pool with the waterslide. The perfect size for younger kids, many hours were spent with the kids splashing around while we relaxed by the pool. There was plenty of activities on the beach and the sun loungers were actually relaxing unlike in Kuta. The kids club was a favourite and in a great location next to the pool and restaurant so easy to pop them in for 1/2 a hour while we enjoyed our meals. Mason wasn’t old enough to go in by himself but they welcome nannies or parents to accompany the younger kids. The rooms were a great size and the first night as it was just the kids and I we stayed in an ocean view room overlooking the pool and beach. Well this made for a beautiful sunrise wake up the next morning, especially great as the kids rise very early! There was plenty of room for a portacot and the balcony was secure for younger kids like Mason who like to climb. We then moved to interconnecting rooms when hubby arrived and these were extremely spacious and well priced. Each room had its own bathroom and wardrobe with a balcony on each room overlooking the internal pool. The kids adventure suites looked amazing when I looked through and were more like apartments if having space from each other is important. The food at Holiday Inn Benoa was yummy and the breakfast awesome, especially as they bought my morning latte to me! I especially love that breakfast started at 6:30am as our kids do not like to sleep in, even on holidays! Perhaps the best part was that kids under 12 eat free in Pasar Market Cafe, Nudi Beach Club and Duke’s Pool bar keeping the budget under control. 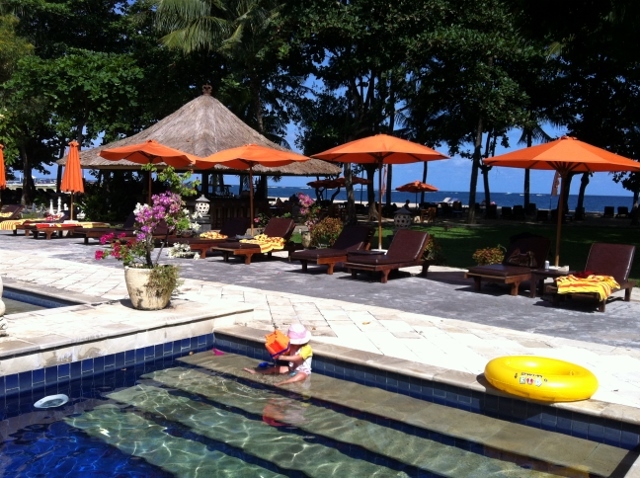 We really loved our stay at Holiday Inn Resort Benoa and can’t wait to stay again one day. If you enjoyed reading about our stay at Holiday Inn Benoa check out our posts on our full stay here or our Holiday Inn Benoa vs Baruna post here. The drive (from Seminyak) to the Padma Ubud is an experience in itself… lush greenery, local farmers, abundant rice fields, cows, ducks, dogs and more! Arriving at the resort, and entering the tropical compound it is absolutely breathtaking. Padma Ubud offers a lovely change of scenery from the popular beaches and a tranquil space for a family to pause, just be, and enjoy some quality, relaxing time together. It was even more magical when we visited during the wet season… misty mornings with the mountains peeping out, and tropical raindrops in the afternoons. There are a variety of rooms available for families including both rooms and suites with either one or two bedrooms. Extra beds and baby cots can also be provided. The staff here are simply wonderful – welcoming, professional and friendly and we really enjoyed chatting and getting to know many of them. There is almost no need to leave the resort… with a choice of restaurants offering buffet breakfast, lunch, poolside snacks, complimentary afternoon tea, cocktails and dinner, or room service if you fancy. There is a kids activity menu and coloured pencils are provided along with it. That famous stunning curved infinity pool looking out to the jungle offers hours and hours of splish-splashing fun, and there is a lovely Kids Club for a change of scenery that also has its own kids pool complete with waterfall and mini deck-chairs and umbrellas. Games, toys, puzzles, karaoke, art and craft and more are on offer, plus daily activities at no additional cost – the girls loved the cupcake decorating classes and of course enjoying the finished product! We also spent some time just strolling around and exploring the extensive hotel grounds… listening to the Gamelan players, feeding the fish in the ponds, and a game of foosball in the lounge. Plus the lovely walk down to the river and across the bamboo bridge is well worth it and a magical experience for the whole family. And if you did feel the need to explore further afield, the resort offers a free shuttle bus into the centre/town of Ubud which is about a 40 minute drive. 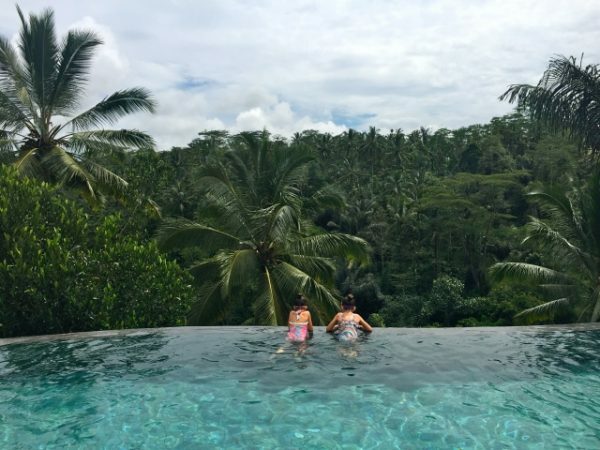 We loved having Jemma from Little Bali Love share about her experience at The Padma Ubud. You can find her at Little Bali Love or on Instagram to follow the girls adventures. The Samabe Bali is the perfect spot for a family vacation if you want to take it easy and love privacy and luxury! The accommodation is perfect for families. The family suites are LARGE and more like luxurious apartments. They come with two queen size beds and they can add cots. We loved the huge living areas and balconies with a day bed. We often saw monkeys out there which the kids loved. There’s also the option of private villas with their own pools including two bedroom options. The resort is just beautiful with its own private beach. It is down some steep stairs that make life trickier with young kids but we did not find it an issue. The best part about a private beach is no hassle. No one asked us to buy anything! There’s also a large infinity pool and some great eating options. One restaurant was on top of fish ponds and the kids were taken by staff to feed the fish while we waited for our meals. The kids club is small but perfect for young kids. They take kids from two years old which is rare so its an extra good option if you have a two year old. There is an activity program at the resort and kids can do many of the options. We enjoyed a cooking class together. There are two different packages – a standard package and an all inclusive option. We loved having everything included and it made life so easy with the kids. Many things can be provided if you are traveling with a baby – cots, high chairs, bottle warmers, sterilisers, carriers, baby baths, pretty much anything. My favourite part was the fact that laundry is included! I hate how stressful it can be getting everyone’s clothes washed but we could call someone at any time to come and collect it. So excited to have Sharon from Where’s Sharon tell us all about her stay at Samabe Resort. To find out more about Sharon’s travels around Bali check out her post here. You can also find Where’s Sharon on Facebook. Hotel Vila Lumbung is my family’s home away from home on Jl Petitenget. I’ll never forget the first time we arrived at Hotel Vila Lumbung – as the taksi drove us down the secure, private driveway to reception I thought, wow this feels like something special. We were welcomed in and given a chilled glass of something tropical as we tried to take it all in. 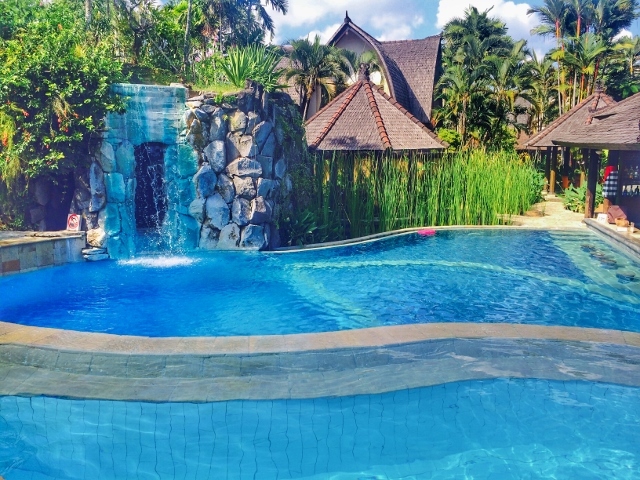 The lush tropical gardens are the first hint of how beautiful this boutique resort is but it’s the pool you walk past as you’re shown to your Lumbung that truly excites the family! We stay in a down stairs Lumbung which is beautifully appointed with great AC. The bed was very comfortable, our daughter has a room to herself with a gigantic king size bed (you could fit 3 children in there!) and we all loved the exotic charm of the indoor/outdoor bathroom. You have a spacious porch and beautiful grassed area to play on just outside your room. Swimming time! As we make our way back up to the pool we explore the immaculate tropical garden as the path winds its way here and there. My daughter can’t believe her eyes and; I’m looking forward to helping her pick flowers, do cartwheels and run around these enchanting grounds. The hotel temple is gorgeous and; fills the imagination. We arrive at the pool – wow! It has 2 levels. The top level has sun lounges aplenty, perfectly arranged around the pool which is landscaped wonderfully, including a bridge to walk over/swim under. The lower level has a very beautiful waterfall to explore as well as a spa and swim up bar. We spend a lot of time at this pool. We choose this resort based on price which is cheap for the area. I also choose it because of its location – close to all the fun of the fancy restaurants, beach bars and boutique shopping which is easy for little legs to handle, with nearby transport options if it all gets too much. Yet due the hotel is tucked away and offers a very tranquil stay. The onsite spa is great and well priced as is the restaurant. At the top of the driveway is a money changer, convenience store and local laundry. We have returned to HVL several times over the years and it will forever be my family’s first choice in the area. Suksma HVL. Thank you to my friend Manda from Bali Fix Travel for telling us all about her family stay at Hotel Vila Lumbung. 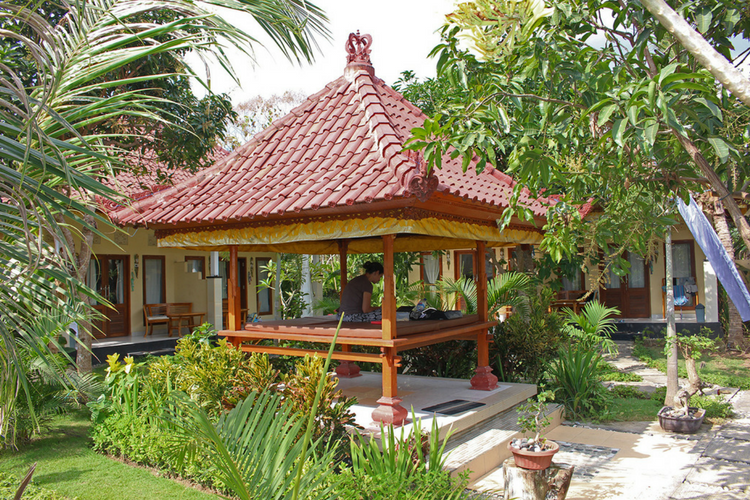 The Mercure Resort Sanur is a lovely resort spread on one of the nicest parts of the Sanur beach. The resort has all your usual resort facilities such as 2 swimming pools, restaurant bar, day spa, tennis court and kids club. One of the swimming pools is located looking out over the beach and is surrounded by the Pandawa Restaurant where breakfast, lunch and dinner is served. We loved having our breakfast here each morning with the views across the swimming pool and beach. The other pool is in a more private area of the resort surrounded by cottages and the kids club. We loved spending our days at this pool with its access to the kid’s room. Both pools were great for kids with varying depths and lots of stairs for the little ones to splash about on. The rooms are situation in various individual buildings with most building having 4 rooms, 2 up top and 2 at the bottom. I would recommend getting a room at the bottom so the kids can have easy access to the gardens. Better still try and get one of the rooms around the quiet pool. For a family with 1 child the standard rooms are plenty big enough. The resort provides cots at no additional charge, however rollaway beds are additional. For bigger families, there are family suites with bunk beds or family rooms which are two story with a king bed upstairs and a sofa bed downstairs. At the time of our stay we own had the one child and she was a toddler. All rooms are air-conditioned, have free Wi-Fi, safe and tea and coffee facilities. The resort is in the quieter end of Sanur; however, there are still plenty of cafes within walking distance of the resort. You can easily walk to the main shopping area of Sanur within 10 minutes, take a cab for a few dollars or the resort has a free shuttle. Unfortunately for us we found the kids club a bit of a letdown, so if you are coming here with bigger kids you may want to find somewhere else to stay. For us our daughter was too young for kid’s club anyway and she loved the sandpit, slide and little bikes they had in the playground. So, for younger kids the resort is ideal. 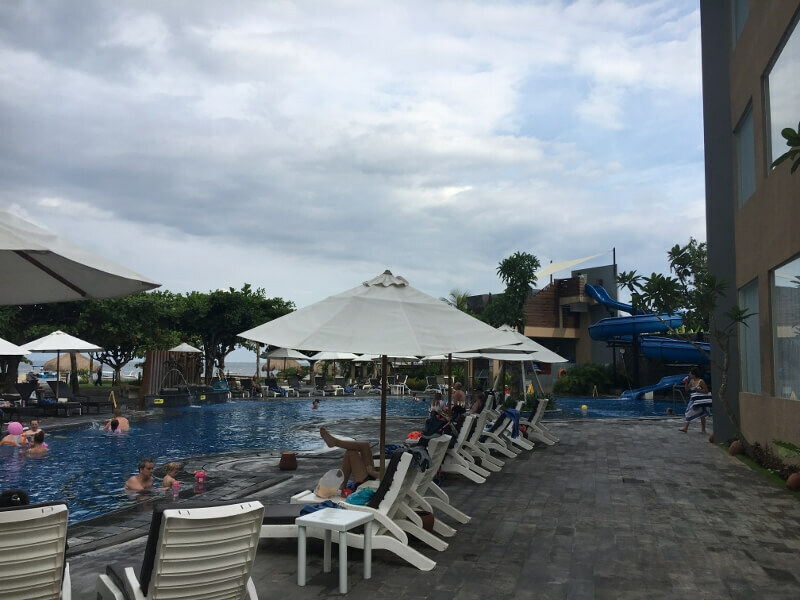 Thank you Melissa from Thrifty Family Travels for sharing her experience at the Mercure in Sanur. You can also find Thrifty Family Travels on Instagram. 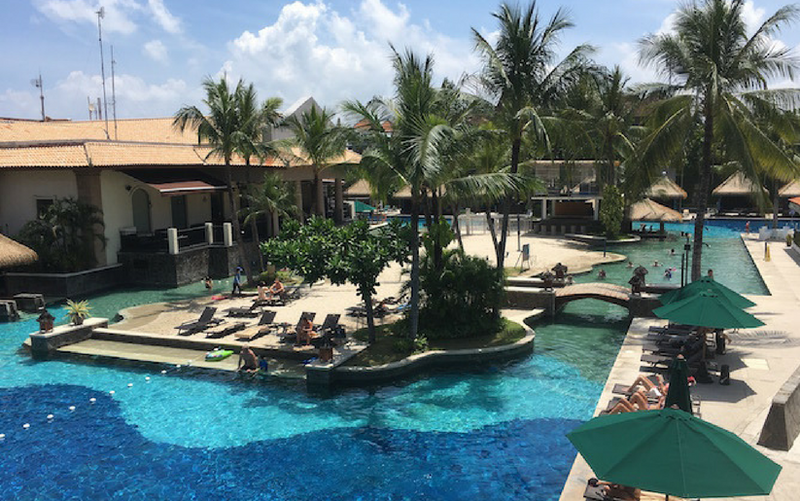 If you are looking for a fabulous family-friendly hotel in Bali, the Hard Rock Hotel Bali may be the way to go. This hotel, part of a worldwide chain, prides itself on understanding what families want and need, and then delivers upon their promise. The centrepiece of the Bali Hard Rock Hotel is the jumbo-sized tropical pool that caters for the whole family. You can book a poolside gazebo and order delicious food to be brought to you directly while you gaze across the azure waters, and hire giant lilos for the kids (young and old) to laze upon. There’s a children’s water play park on one side, a shallow sandy-bottomed swimming area in the centre that the kids adore, and a swim-up pool bar, complete with Oreo mocktails for the kids and decadent summery cocktails for the adults of the group. Best of all, the kids can join in daily supervised poolside activities and games, and once a week, be smothered with bubbles at the Hard Rock Hotel Foam Party. The pool area at this hotel is SO good, you’ll find it almost impossible to tear yourself away. But, when you do, there’s two in-house restaurants featuring delicious Indonesian and Western dishes, plus the Hard Rock Cafe and Jamie Oliver’s Italian right next door. There’s daily kids club for children aged 4-12, plus the Tabo Games Room and Movie Theatre for teenagers and family. Mum’s and dad’s can enjoy time out from the kids while indulging in an onsite massage at the Rock Spa. We highly recommend the foot massage – it’s heavenly. The Bali Hard Rock Hotel is located right next to Kuta Square, one of Kuta’s main shopping areas filled with surf shops and boutiques, and is directly across the road from Kuta’s main beach. A 10 minute walk from the front door will deliver you to a Shopping Centre – go right to shop at the upmarket Beachwalk shopping centre north, or left towards the Discovery Kartika Plaza. You’ll find plenty of market stalls, and locally-owned shops along the way too. We highly recommend the Bali Hard Rock Hotel for family holidays. My kids rate it as one of their favourite hotels ever. Thank you so much Amber from Roam the Gnome for sharing your experience of the Hard Rock Hotel. We especially loved the video! You can also find Amber on Instagram. We love spending half our trip in Nusa to unwind and chill out a bit and this resort was perfect for that, and so great for the kids. We stayed in a Family Room which was a two story loft type layout. The room had 2 single beds down stairs (and we fit a cot as well), a balcony, a bathroom, toilet and wardrobes. Upstairs was a king size bed and another bathroom and wardrobe. It was so spacious and perfect for our family of 5. The pools at the resort were incredible, lots of small shallow areas which were a huge hit with our 2 year old. There were volleyball nets, and endless activities such as water aerobics, yoga etc always going on. The kids pool which was a great depth for my little one and he loved playing with his toys cars along the edge. The Kids club is fantastic! A lovely outdoor area with swings and play equipment which they also decorated beautifully for Easter . My older son went here most mornings , my daughter isn’t as keen on kids clubs anymore but he had a ball. They did visits to the hotel temple where they dressed in traditional clothing, made Balinese offerings, disco nights, movies and also took them off to the restaurant for lunch if you wish. Hotel Activities – The hotel is right on the beach so there is lots of water sports on offer. My favourite was the Stand up Paddle Boarding. Was $10 for an hour which was a great price! We had to get there before 2pm because the tide would go out after 2 and there was no chance of paddling then. There is also jet skis as well as snorkels etc. There is some great restaurants at this resort but our favourite was right down on the water at the SATERIA BEACHSIDE RESTAURANT . There was a fab little deck which overlooked the water and the food was amazing with some great tapas dishes ! The breakfast was the best I have ever had. Everything you can think of was on offer ! It got a little crowded at times but there was plenty of food and plenty of seating. Some other bonuses at this hotel are the 4-7pm happy hour on drinks which makes those pina coladas very affordable ! Also you are given voucher booklets for each guest when you check in for discounts on food, spa, drinks etc and they all add up to a great saving ! Oh and another thing if you put $100 on your account at once you save 20% on your meals which is fantastic. 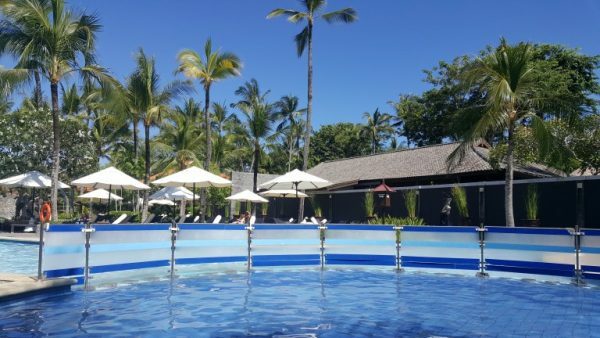 Many thanks to April from Globe Trotting Grommets for sharing her thoughts on the Melia Resort. You can also find her on Instagram here. We spent two months in Bali as part of our 10-month adventure in South East Asia. This was our first big trip with our 1,5 year old son. Since we had a strict budget we tried to find accommodation that was budget friendly, but also comfortable and clean. We stayed at Shipwrecks Beach Resort our first night on Nusa Lembongan, but felt very uncomfortable there. At IDR 500.000 the Garden Room at Taos House on Nusa Lembongan was a bit above our budget, but it ticked all the boxes. The room was bright and clean and had enough space to put our son’s travel bed. And, it came with a free breakfast. Our little one could stay in our room for free. One small issue we had was that the shower was only luke warm. The staff tried to fix it, but didn’t manage the three nights we were there. All three of us really enjoyed the nice swimming pool and the luscious green garden where our son could run around as much as he liked. Taos House is owned and operated by a local family and they can give you excellent tips of were to go and what to do. They had two small kids of there own, who were more than happy to play with our little one. We had a lovely stay at Taos House and can recommend it. On a visit to Bali in 2014 we found ourselves at Woo Bar for sunset drinks, and after the walk (and a few cocktails) through the resort to the road I had firmly decided that if we were to return to Bali, THIS was indeed where I wanted to stay. Fast forward a year or so and I was busy planning a getaway for an ‘ending in zero’ birthday. 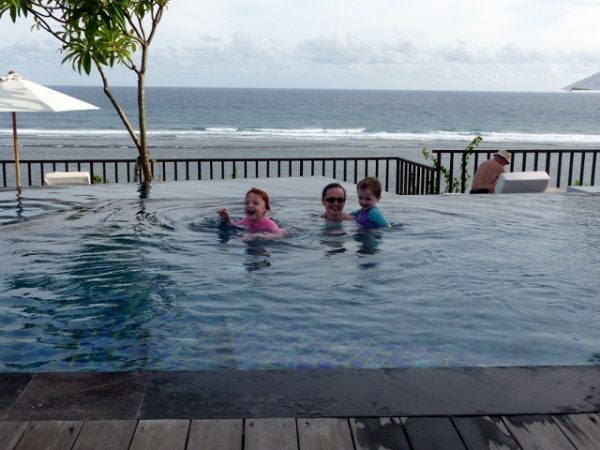 We had arranged to meet friends from Perth who had two young boys, and so spent 7 nights in Canggu at Pantai Indah Villas (which is just brilliant with children), followed by a splurge of two nights at W Retreat Seminyak, in a wonderful Garden View room. Well you know what they say about ‘best laid plans’, after a unscheduled two night stay at BIMC Hospital early in the trip we were pleasantly surprised when a friendly local volcano decided we deserved to increase our stay at W to 6 nights in paradise. Paradise it was. Whilst it isn’t particularly marketed as a hotel for children we found it the perfect balance of child friendly without feeling like we had landed in the middle of a theme park in school holidays. From the minute we completed the booking W’s concierge service were in touch asking after any special requests. We mentioned that it was my birthday so they promised goodies on arrival. We also pre-booked the Sunday brunch using this service, which we were actually attending in the days before we checked in. The whole hotel has a bit of a funky, nightclub type vibe. Little touches like the candy bar and the huge big pebble like cushions in the lobby were a hit with any kids that walked by, not just ours. Miss 2 was particularly taken with the ‘dancing lifts’, in which the welcome mats and music were changed three times daily to suit a morning, afternoon and evening feel. Once we arrived in the room we were pleasantly surprised with the size of their most basic rooms. We had a king size bed and they had made up a couch to make a generous child sized bed, certainly big enough for two kids (I am not sure if they allow that many people in one room however). The best feature for me was the separate bathroom. As well as a door on the toilet (crucial in Bali in case of upset tummies! ), one on the ‘wet room’ which housed the bath and shower- complete with skylight, there was also one separating the entry, wardrobes and bathrooms from the bedroom. It was great for me who would get up earlier than husband and child and shower without disturbing them before heading downstairs with laptop in hand for coffee. This bought me often an hour or two of blissful peace by the pool! Breakfast for the garden rooms was at Fire restaurant. The selection here was great and most definitely something for everyone. Miss 2 was allergic to egg and they were very acoomodating with dietary requirements and more than happy to bring modified versions of some of the food. She was also very impressed with her morning babycino that came with a large chocolate M for Millie on top- or was that a W??! Not to mention the chocolate fountain… On arrival into fire there is a large wall with many different mugs- each morning choosing our own as we walked in was a novelty! The wonderful staff then whisked it away returning shortly after with it filled with our beverage of choice. Fire was such a relaxing spot to spend our mornings, we sat outside by the pool and never felt rushed, almost encouraged, to sit and enjoy our coffees and read the paper. It was very helpful once we were ‘stranded’ and wanted to catch up on that pesky volcano’s activities. The pool at W is in tiers that resemble rice paddies, which made for lots of little ‘sections’. This added to the feeling that you weren’t in an overcrowded public pool as there were plenty of different ‘areas’ to play in, even when the hotel was at capacity. It was easy enough to find a cabana early in the day, and once we plonked ourselves there it was hard to work up the enthusiasm to leave. Drinks and food were ordered and kids were entertained- both by the multitude of floating beanbags in the pool, and by the staff. In lieu of kids club, each afternoon there would be scheduled activities by the pool- sandcastle building, bubbles, balloon animals. Again, it was never over crowded and it was always a huge hit with our group of children! Add that to the floating staff who were also on hand with a cool misting body spray and sunglasses cleaners, or flavored water stations, and everyone was very happy to laze the day away! Overall- I wouldn’t hesitate to return to W with young children. Even the famous Sunday Brunch at Starfish Bloo caters for children with its huge selection of foods and activity table set up just the right distance away from the diners. Plus, an over abundance of lollies! 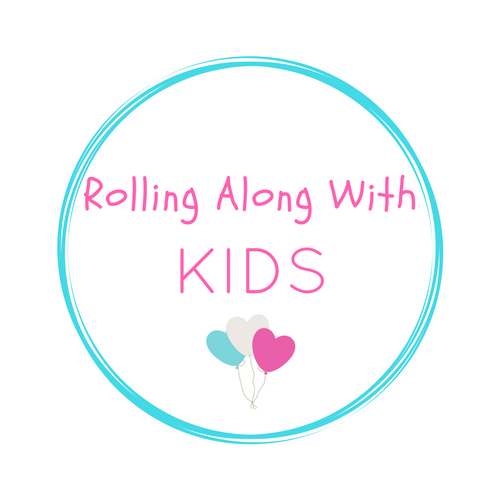 I found the whole experience to be the perfect blend of child friendly in an environment that wasn’t directly aimed at holidaying with children, and would never hesitate to return! Lovely to hear from Jessica, mum of 2, who I have become friends with through a Facebook Bali group about her stay at the W Resort Seminyak. We recently returned from a 5 night stay at the Grand Mirage. We frequently visit Bali but have always stayed in villas, but with our 2 kids (aged 2 and 4) getting that bit older, we thought it was time to try out a hotel. We had a fantastic time and would highly recommend it! We stayed in a Junior Suite in the recently opened Family Paradise Wing of the hotel. It is called a wing, but really, it’s basically its own separate hotel (which is next door to the main hotel) with its own pools, restaurants etc. The best part about this set up is that while it feels like its own hotel, because it is a part of the main hotel you get the best of both worlds, you can use all of the facilities at both, and it is a short 40 metre stroll along the beach path between them. Because the family wing has only recently opened everything is very new, modern and clean. The room set up was great – spacious, really comfy beds, a balcony, perfectly air conditioned. The separate kids room came with a bunk bed and trundle bed so can sleep 3 kids – also had a beanbag, desk, its own TV, heaps of cupboard space, and its own bathroom – complete with kid height sink! On the down side – there was no window in the kids room so no natural light, and the top bunk is very high. Even though it has a good side barrier, I wasn’t comfortable with my 4 year old sleeping up there so put her on the bottom bunk and my 2 year old on the trundle. Our room was overlooking the “garden” which was really just the vacant lot next door to the hotel. I would definitely recommend requesting a room facing the pool/ocean, and on the ground floor for easier access going to and from the pool. The main pool area is great – our kids loved it, especially the water slide. There’s a bar/restaurant right next to it and they do table/pool service so you can just order your drinks from the pool. There’s also a separate kids waterslide park out the front of the hotel. Our kids thought it was amazing! Life guards were patrolling both pools at all times too. The hotel has a great kids club for kids aged 4 and up, we didn’t use it much as our 4 year old didn’t really want to be separated from us, but the activities all looked good and the staff were so lovely. If you have kids under 4 you just have to pay for 1:1 care for them to put them in the kids club (we didn’t do this – but I was told it was about 9AUD an hour). Even if you weren’t leaving the kids in the kids club you could go in there and play with them, which was great when you wanted some down time out of the heat, and there was also a games room with video games, table tennis table, and pet baby rabbits which my 2 year old absolutely adored! Buffet breakfast was great- big selection of basically every breakfast food you could think of and available in both the family paradise and the main hotel. We ate in the main hotel as it was a bit bigger and nice to go for a stroll in the morning. For lunches/dinner there are about 5 or 6 restaurants to choose from, we tended to eat out rather than at the hotel, but did have the Rama buffet one night which was great. The beach grill was highly recommended but we didn’t manage to get there. Like everywhere in Bali the staff are of course amazing, always smiling and so helpful, and the hotel just had a really laid back vibe. 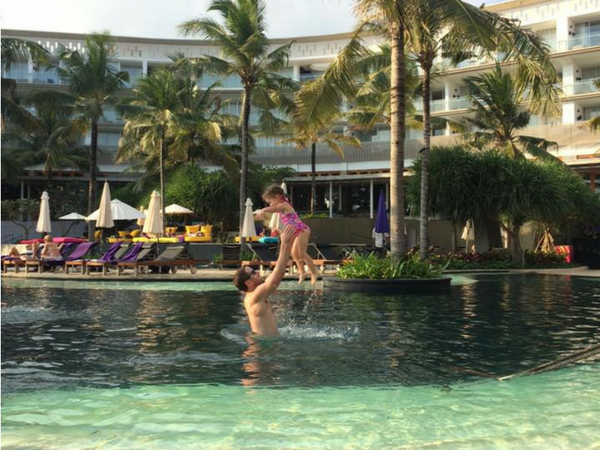 Best of all, everything was just so easy with kids, which is exactly what you want on holiday! We had a wonderful stay and would definitely go back. 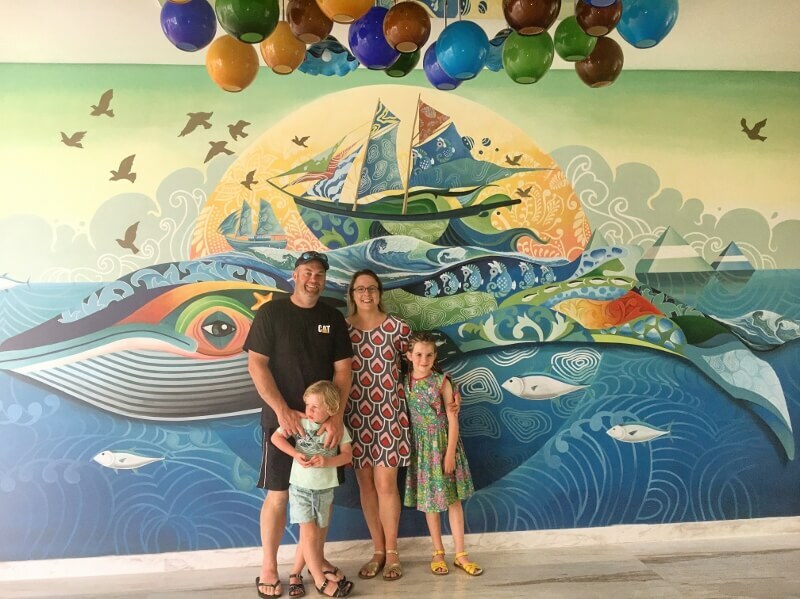 Thank you so much to Katie, Mum of 2 young kids and fellow Bali lover, for offering to share her families experience at the Grand Mirage Resort. It is much appreciated having other Mum’s opinions to share. Thank you to everyone that contributed to this post, we love sharing views from families as we can’t stay in every place in Bali. If you would like to contribute to a post about your stay at a family friendly hotel, send me an email or contact me through Facebook or Instagram.